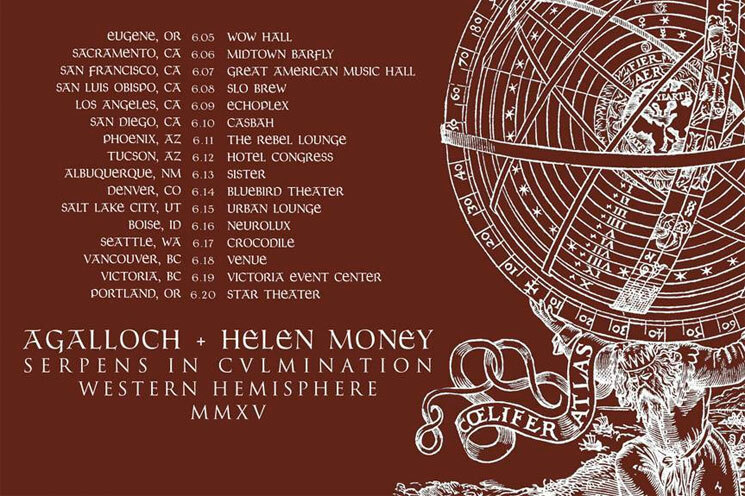 Portland metal outfit Agalloch have announced they'll be bringing the blackened tones of their Exclaim!-favourited 2014 LP The Serpent and the Sphere out on another trip, this time over a series of dates along on the western part of the continent. The band have revealed the next leg of their "Serpens in Culmination," which runs throughout June. Last year, the band supported the then just-released The Serpent and the Sphere with a batch of East Coast dates, having hit Canadian clubs in Ottawa, Toronto and Montreal along the way. This time around, they'll hop up over to the northern side of the U.S./Canada border for shows in Vancouver and Victoria. The opening duties will primarily be held by experimental doom cellist Helen Money (a.k.a. Alison Chesley). There's also an upcoming show with fellow Oregonians YOB and Italian prog-metal trio Ufomammut. You'll find all of the details down below.